Macroscope is a hidden picture game designed by Martin Nedergaard Andersen and published in the United States by Mayday Games. 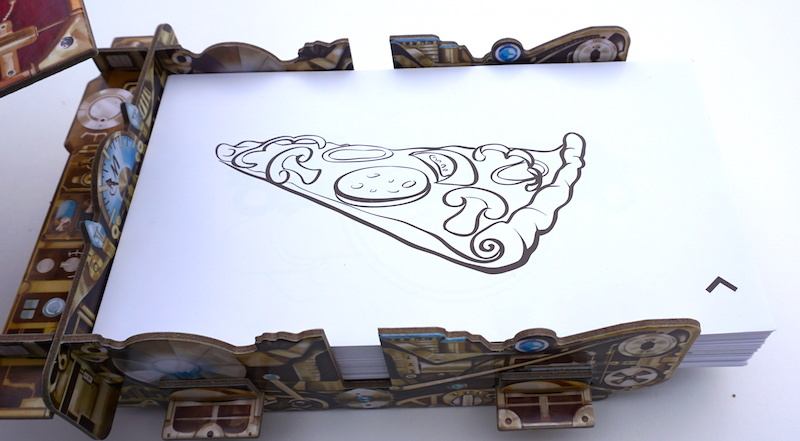 Players take turns removing up to two tokens per turn from the lid of the macroscope. Each token will reveal a small portion of the picture hidden underneath. The first player to guess the picture gains points equal to the number of tokens remaining. 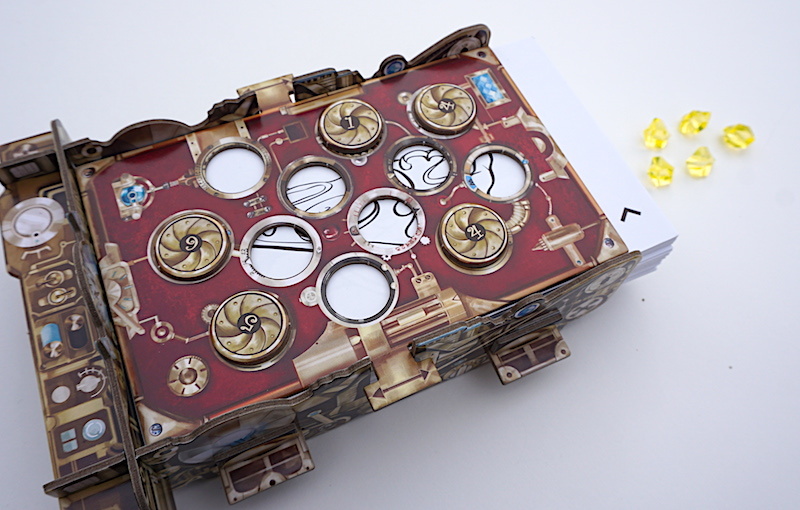 Once the picture has been revealed, the round is over and the tokens are replaced to cover the next picture. 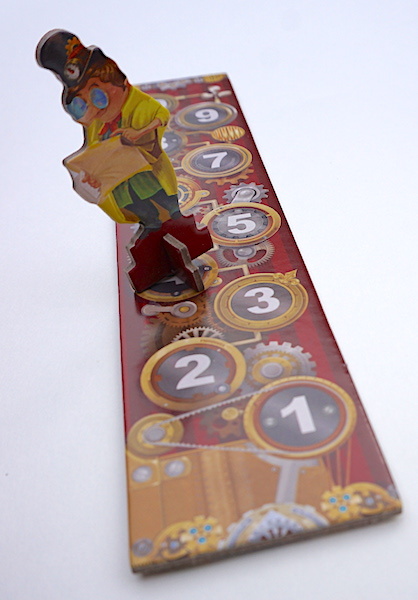 There are two ways to play Macroscope: the normal rules and the family variant. In the normal rules, players roll two dice and remove windows matching each die, one at a time. They may guess at the picture on their turn, or spend 2 gems (points) during another player’s turn to challenge their guess. If a player guesses wrong, they lose points. The number of points gained or lost is the number of closed windows on the macroscope, so guessing early is risky but potentially very rewarding. In the family variant, a player may guess at any time, writing down their guess (and how many windows of the macroscope are covered). Once all players have guessed, the picture is revealed and the player(s) who guessed right earliest gains points. Any other correct guesses gain 1 point. No one loses points in this style of play. In either way to play, the game continues until the 10th round, and whoever has accumulated the most points, wins. We really wanted to like Macroscope. The steampunk style and unusual approach to gameplay sparked interest both for adults and kids. Unfortunately, there are several areas where Macroscope loses focus. Playing according to the normal rules was frustrating. If a certain player is a better guesser, then the player immediately after them is consistently put at a disadvantage: they nearly always start with a new picture and nothing revealed. Since players can only “challenge” on other’s turns (ie. pay to make a different guess than the current player), there is little or no chance to recover unless another player makes a mistake. Playing the family variant was better, but still frustrating to the kids, as they usually needed many more spots uncovered to make an educated guess. The last problem was the pictures themselves. It appears that many were drawn to be purposefully hard to guess. Unfortunately, some were so hard to guess that they left us arguing even once they were revealed (one was a European-style power outlet). Before we had enough experience with the game to write this review, our children were tired of Macroscope and complained when we brought it out to play. It might work better in a group of just teenagers and adults as a light filler game. If your family loves Pictionary but would like to try something different, Macroscope might be the right game for you. At about $25 on Amazon, it provides 400 pictures to guess. The Family Gamers were provided a copy of Macroscope by Mayday Games for this review.